Firstly, you'll need to login via SteemConnect through the app which is very simple as most of the Dapps that is build on Steem Blockchain uses this method. 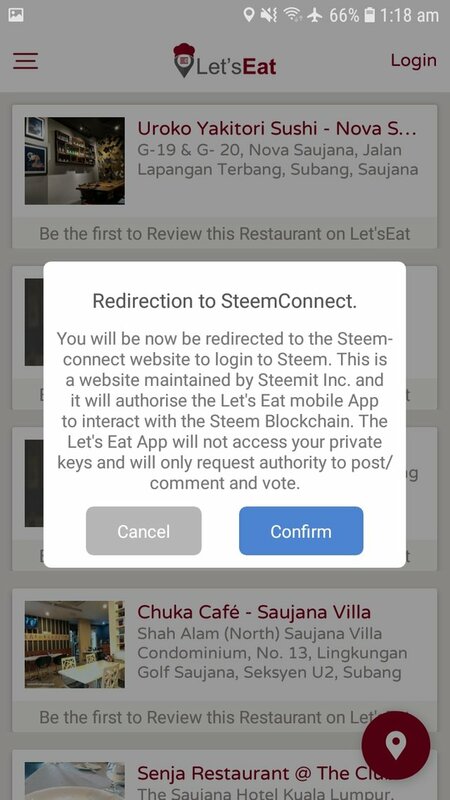 Remember, you can't post or give review without logging into an Steemit account, be sure to get your friends to signup a Steem account before posting on Letseat. 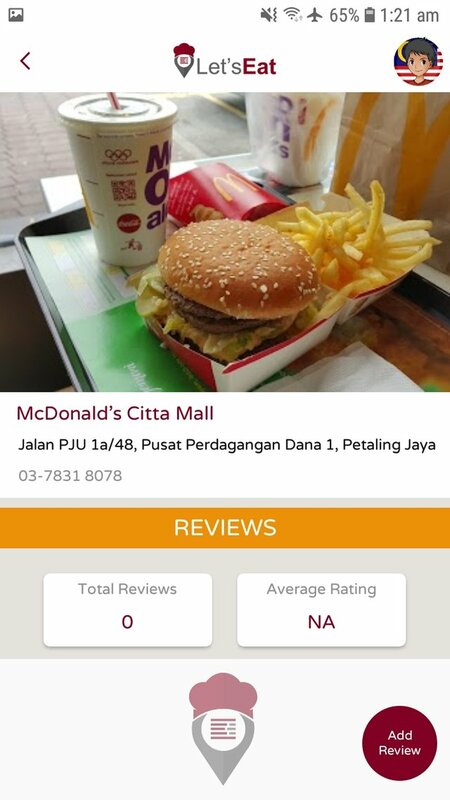 The UI is just simple and neat that every user will find it very easy to navigate and post a food review but the UI is not final as Letseat is still in beta and might differ from the time this post was written. 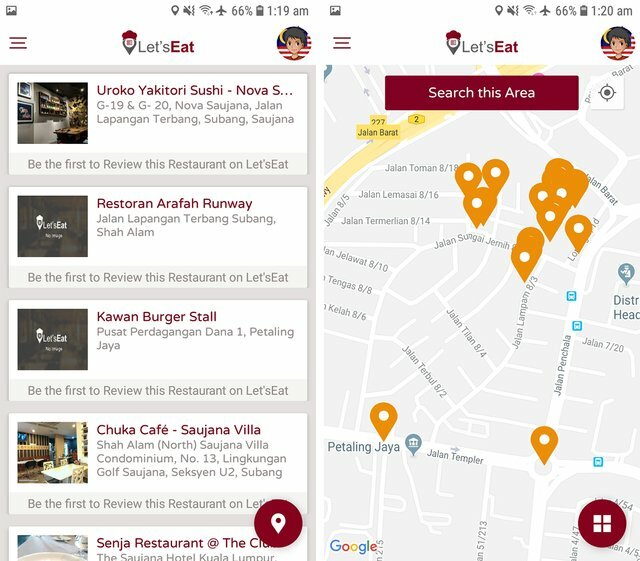 Homepage, where you will see a list of restaurant nearby your location everytime you launch the application or after you've login to your account. 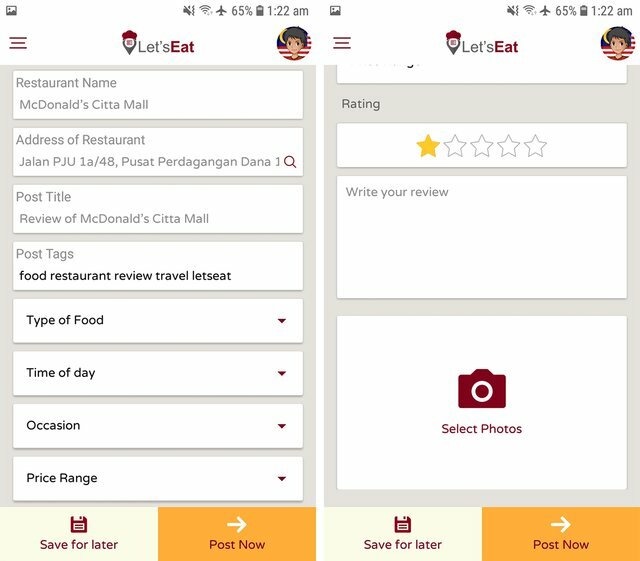 Firstly, search for the restaurant that you are visiting or wanted to visit via the search nearby list view (Left) or the map view (Right). 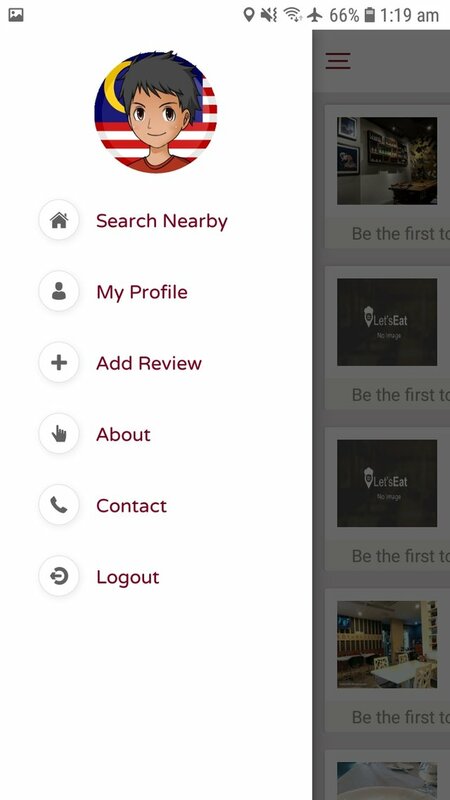 You can toggle between the view by pressing the bottom right icon and map view allows you to search for restaurant beyond your current location to either give a backlog/previous review or simply scout for restaurant for your lunch or dinner 😏. If you're unable to search for the particular restaurant to give your review, need not to worry as you're able to manually key in the details via the Add Review on the menu. Restaurant which aren't being reviewed are in a orange point (as shown above) whereas those which are reviewed are in letseat logo. Once you have located the restaurant that you are giving review to, simply click on add review on the "Add Review" shown on the restaurant and it will prompt into a detail key in process. All the details like Restaurant Name, Address and Post Title are automatically key if you choose the restaurant from the given point on the map or list view. Details that you'll need to enter are Tags, Type of Food, Time of Day, Occasion, Price Rang, Star Rating, Your Written Review and Image. Currently, these are the detail you'll need to key in and hopefully in the future, more option are available such as video uploading or full resolution image display on Steemit. Once you're done with your review, click the "Post Now" to submit to the Steem Blockchain or "Save for Later" to post later or drafting and enjoy your food first! 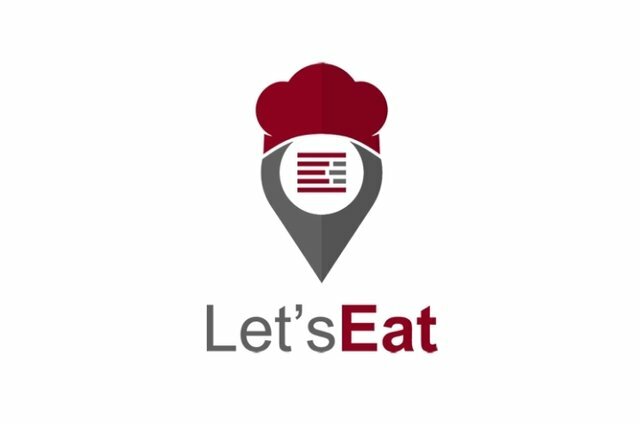 Remember to join the Let's Eat community in Discord by clicking this link, https://discord.gg/msgwmHy. Discussion, suggestion or report any bug that you've encounter right here! Hope this guide is detailed for your understanding and Happy Let's Eat! 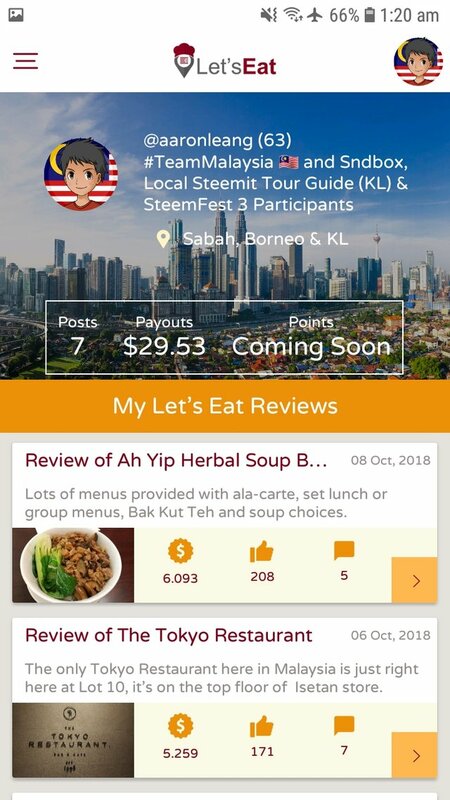 I’m Aaron Leang from Malaysia, had started blogging on Steemit since November 2017 and has been actively participating in shaping and building up the community in Team Malaysia together with some other awesome Steemians. I’ve been known as the meetup organizer for any local gathering and also International Steemians Meetup who came to visit in KL, Malaysia. 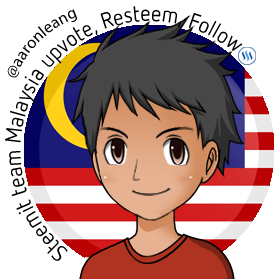 Ways to get in contact with me are Discord (AaronLeang#5270) or Telegram (@aaronleang) while you're at Malaysia, I can set up an awesome meetup with #TeamMalaysia! Interested in Steemit? You can get your account with just one click away, HERE and blog together with WordPress via SteemPress plug-in. Hey @culgin, thanks for dropping by! Yea, is certainly easy to use for any user I would say. Congratulation @aaronleang! Your post has been recently featured on #TeamMalaysia's Daily Pick Series! Your UA account score is currently 3.615 which ranks you at #5450 across all Steem accounts. Your rank has improved 85 places in the last three days (old rank 5535). In our last Algorithmic Curation Round, consisting of 227 contributions, your post is ranked at #59. Congratulations! This post has been upvoted from the communal account, @minnowsupport, by AaronLeang from the Minnow Support Project. It's a witness project run by aggroed, ausbitbank, teamsteem, someguy123, neoxian, followbtcnews, and netuoso. The goal is to help Steemit grow by supporting Minnows. Please find us at the Peace, Abundance, and Liberty Network (PALnet) Discord Channel. It's a completely public and open space to all members of the Steemit community who voluntarily choose to be there. You got voted by @curationkiwi thanks to AaronLeang! This bot is managed by Kiwibot and run by Rishi556, you can check both of them out there. To receive maximum rewards, you must be a member of KiwiBot. To receive free upvotes for yourself (even if you are not a member) you can join the KiwiBot Discord linked here and use the command !upvote (post name) in #curationkiwi.